At Uber, our mission is to provide access to convenient, reliable transportation for everyone, everywhere. And we aren’t alone. Many businesses want to make it easier for their customers to go about their day — whether they’re picking up a last minute gift, dropping the car off for an oil change, or heading to an appointment. That’s why we’re excited to launch UberCENTRAL, a new way for businesses to connect with their customers. 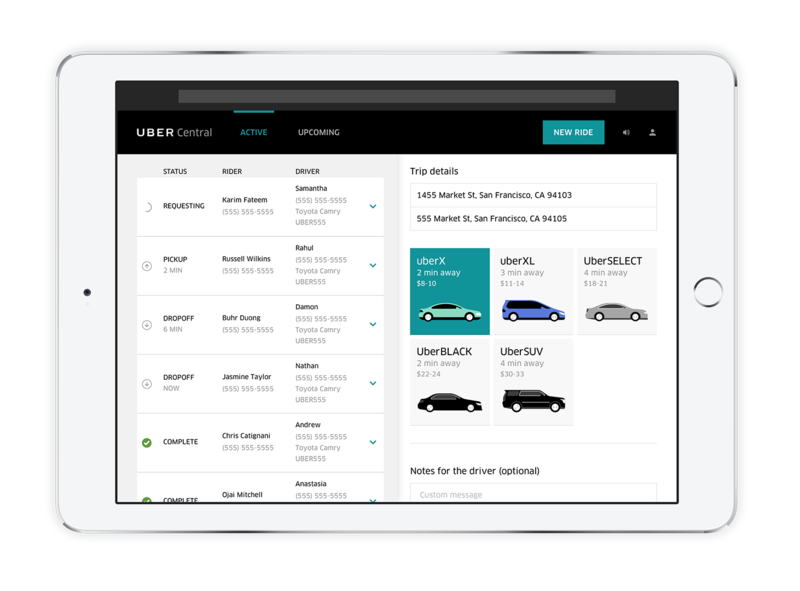 UberCENTRAL is a dashboard that enables any business — large or small — to request, manage, and pay for multiple Uber rides on behalf of their customers. UberCENTRAL is designed with all kinds of companies in mind — from senior centers and retailers to car dealerships, hotels, and more. Here’s how businesses are already using UberCENTRAL to provide a better customer experience. Often the people who need reliable rides the most don’t have smartphones and have never downloaded an app. Senior citizens at the Benson Center in Atlanta used to have to book rides up to two weeks in advance to get around, or depend on a fixed shuttle schedule that left little room for last minute changes. Since the center started using UberCENTRAL, seniors have enjoyed much greater mobility and independence. The Center books rides on seniors’ behalf so they don’t need to use smartphones, then volunteers call the seniors to let them know their driver’s information and arrival time. Common Courtesy, a nonprofit dedicated to helping people with limited mobility, also partners with UberCENTRAL to help seniors get where they need to go, whether it’s a doctor’s appointment or a trip to the grocery store. Enhancing care is a top focus for MedStar Health. Lack of transportation is a barrier to care and improved health for many people who miss appointments or have to reschedule at the last minute. Others spend hours waiting for someone to take them home after an appointment. Now with UberCENTRAL, MedStar Health can help provide eligible individuals who have a medical and financial need with reliable transportation within minutes, helping them access the care they need or getting them back home quickly. Companies and brands are elevating service with UberCENTRAL. Hugo Boss is reimagining customer experience by making shopping effortless and ensuring clients always travel in style to their store appointments. For Hotel Angeleno in Los Angeles, UberCENTRAL makes travel seamless for guests whether they’re heading to the airport or exploring the town. And at Bloomingdale’s, valued customers can skip the hassle of parking and cruise straight to the store. Multiple ride requests from a single account. Simply enter the customer’s name, phone number, pickup address, and destination, and an Uber will be on the way. Manage multiple rides at once and keep tabs on trips from one central place. No smartphone, no problem. Once the ride is requested, your customer receives an SMS with details about their trip and driver, including a link to a live map, to ensure a seamless pickup experience. Simple admin tools. Configure all of your business locations, and centralize billing and reporting. We’re excited to see how companies and organizations use UberCENTRAL to drive their businesses. Sign up for free to get started. *Outside the US or Canada? Sign up today and we’ll notify you when UberCENTRAL is available in your country.